Take control with the Defender MAX DPS that features comfortable Dynamic Power Steering (DPS), lightweight wheels and tires, adaptable storage, Visco Lok QE and more to make your job easier. HEAVY-DUTY ROTAX V-TWIN ENGINE: The 72 hp Rotax HD10 V-Twin is specifically tuned for serious work but also offers 61 ft. lb. torque and peak torque at lower RPM for optimal delivery for recreational use. HIGH RIGIDITY CHASSIS: The Defender MAX is an extremely capable off-road vehicle and a legitimate workhorse that uses an all-new chassis with automotive-like technology and fabrication tolerances that are in line with modern pick-up trucks. The high-strength, low-alloy (HSLA) grade steel means a more rigid design for taking the strain of heavy-duty chores. Can-Am engineers put the Defender MAX frame through the new rigorous Utility Test Cycle at the winter and summer testing grounds to ensure its toughness. 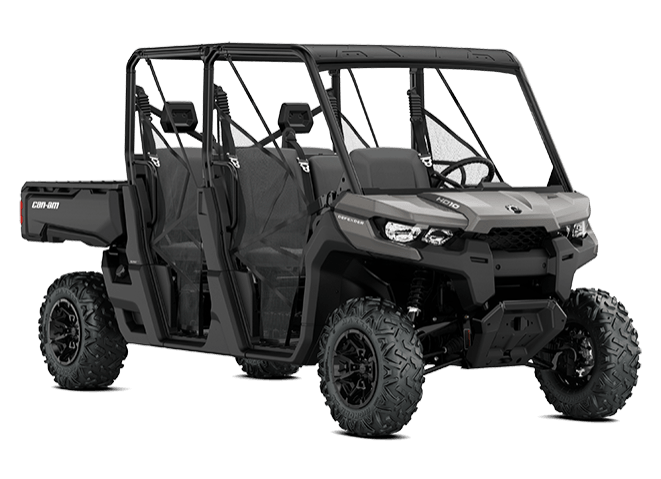 TTA-HD REAR SUSPENSION: The Defender MAX DPS heavy-duty Torsional Trailing A-arms (TTA-HD) was designed specifically for a utility and recreational usage, offers a full 10 in. (25.4 cm) of travel to provide a smooth ride whatever the terrain. Its architecture offers an optimal comfort and drivability in all conditions thanks to no camber. DUAL VERSA-PRO BENCH SEATS: The Dual VERSA-PRO bench seat is engineered as a 40/20/40 bench seat, inspired by modern pick-up trucks. The Defender MAX can comfortably accommodate six adults and features “profiled” corners to improve entrance / exit of the cab as well as a sturdy vinyl cover for improved wear resistance. The five passenger seats have integrated hooks on their underside and can also be flipped up to improve onboard storage. Can-Am designers also added front and rear foldable armrests with cup holders. OPEN DASH WITH REMOVABLE TOOLBOX AND UNDER DASH STORAGE: The open dash design features a handy removable and water-resistant 1.7 gal. (6.3 l) toolbox, an industry exclusive, to allow users to carefully carry tools and supplies they need in an organized manner. In addition, it includes 6 gal. (23 l) of under dash storage with an enclosed pocket, perfect for stowing small essentials. All in all, the Defender MAX proposes a total of 11.1 gal. (42.1 l) of storage solutions. MULTIFUNCTION CARGO BOX WITH STURDY TAILGATE: The highly durable Cargo box has a 1,000 lb. (454kg) load capacity and easily dumps. Strategic features include 5 gal. (18.9 l) pail recesses, integrated anchors on the sidewalls and several tie-down points for added convenience. To fully optimize the sizeable cargo box, consumers can divide up the box using the integrated recesses. The box allows for both 1x3 and plywood separators and accepts bed extenders for refining the bed’s overall dimensions. Also, the sturdy tailgate can withstand ordinary farm use and serve as a seat during your lunch break (max weight: 250 lb / 113kg). 27 IN. (68.6 CM) MAXXIS† BIGHORN 2.0 TIRES ON 14 IN. (35.6 CM): The Maxxis Bighorn 2.0 tires offer a smoother ride, predictable cornering and optimum climbing confidence. Installed on redesigned cast-aluminum wheels featuring a strong lightweight construction. MOSSY OAK BREAK-UP COUNTRY CAMO WATER DIPPED OPTION: When it comes to concealment, nothing compares to the exclusive Mossy Oak Break-Up Country camouflage. The highly durable water-dipped camo finish is more resistant to scratching, mineral deposits and sun fading. 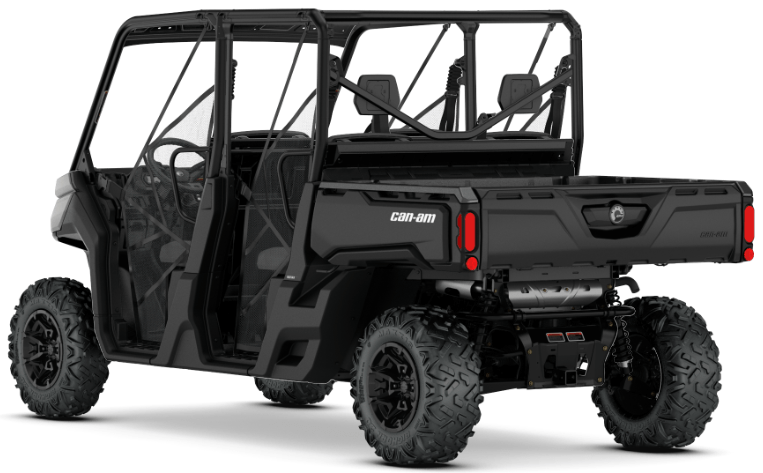 More importantly, it lets hunters match their favorite camo manufacturer with their favorite side-by-side vehicle brand.